I decide to post a second version with links to alternative placed to listen to the 1 minute audio. Also, for the hearing impaired, I'm posting the words below that are basically a transcript of the audio message with hopes you are encouraged by what is communicated! Know your worth! You are worthy and worth it! Let me tell you something that I suspect you haven't been told lately or maybe not at all. So, maybe you don't know it or believe it right now but you're highly valuable, very capable, of great worth and an awesome person! No matter who tries to hold you back from what you're supposed to be doing, no matter who tries to put you down, no matter your current circumstances, no matter the lies you start to believe about yourself, or others tell you about yourself (co-workers, friends, family, kids, neighbors, etc) or you tell yourself...you have to know your worth! Don't believe the lies or settle for other people's limited opinion of you! Know your worth for who you are and for all you are and all you are growing to become! This life is a journey and we're all a work in progress so remember these things in the good and bad times because you are worth it friend! 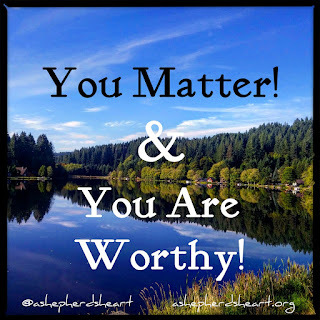 You are worth it and worthy! If you are encouraged by this message, Please share this with others! Encourage and help build them up!